1 Synergy Energetics Technological Research Investment Corp. The need for a clean energy is a global issue. In the European countries there is a huge amount of solid/gaseous/liquid fossil fuel consumption, which mostly comes from imports. CO2 emissions from the use of these conventional fuels continue to add thousands of tons of greenhouse gases each year to the atmosphere, as a significant contributor to global warming. Not to mention that the cost of these fuels continues to rise with the uncertainty of supply. There is another problem in the EU and worldwide: how to manage and eliminate the huge quantity of organic waste materials. Neither incineration nor landfilling is an acceptable solution due to the enormous quantity of harmful emissions of these processes. Both fossil energy source materials and organic wastes can be used in “green energy” production with the application of a tested and proven “clean coal” technology, TCG – Thermo-Chemical Gasification – developed in the US. Here is the opportunity for both the revitalization of the coal mining industry and the environmentally clean industrial application of fossil energy sources or organic wastes, thanks to the near-zero emissions of a proven clean coal technology. This is a major step forward in tackling the emissions problems connected with energy generation and with disposal of organic waste. Although there is a huge quantity of fossil energy source materials in Europe, we do not mine and use them; instead, we are importing these materials to meet the energy needs, and are making huge efforts to increase the ratio of green energy in the total energy consumption of Europe. Politicians and most experts think that coal and other fossil fuels are the main risks to the environment, and cause the biggest part of the greenhouse gas (GHG) emissions. Thus, the European Union launched certain measures against fossil fuels, mostly against coal mines and coal-fired power plants. During the last 15 years some important steps have been taken on this route. The governments of the EU Member States (MS) step-by-step decreased – and later withdrew – subsidies supporting the home mining industry against the cheap coals of the world market (in Regulation (EC) No. 1407/2002) and Council Decision of 10 December 2010 on State aid to facilitate the closure of uncompetitive coal mines (2010/787/EU)). Later on, the not “economically operated” mines were closed, and the CO2 quota system was introduced. According to industry experts, unless coal emissions are phased out within the next 15 years, we will not meet the targets for carbon reduction as promised in the Paris Agreement. Although coal output is falling by approximately 1% per year overall, it still accounts for a quarter of all energy produced in Europe, and a fifth of its greenhouse gas emissions. Referring to the Paris agreement, which has been signed by 26 European states, the UK announced that all coal-fired plants will be completely replaced by 100% carbon-neutral sources by the year 2050. Moreover, it is all the same if we use European or Australian coal – harmful gases and elements are continuously emitted, because the technology is not a “zero emission” one. Another major question is grid expansion, which is expensive and far behind schedule. Due to the EEG subsidy for renewable power and the decline in coal and CO2-certificate prices, wholesale electricity prices have fallen to very low levels and while coal is still needed to guarantee the security of supply, more and more coal-fired power plants can no longer operate profitably. For this supply security reason, a minimum of 10-25% of the total electricity consumption has to be generated by coal-fired power plants or other schedulable, controllable and adjustable technologies. The energy consumption and the electricity demands of developed and developing regions of the world create an almost insurmountable problem, particularly if GHG emissions must be decreased radically. Other issues such as the limited availability of the usable land in the EU also mean a problem in the exclusive application of wind and solar energy generation. Although the efficiency of solar panels has continuously grown during the last decade, a large amount of land area is needed for the solar panels. A 500 TPD (ton/day) capacity TCG–UC W2GE power plant produces 23.78 MWh, that is, 178,107 MWh of electric energy production yearly. This power plant needs only about 2-4 ha (20,000-40,000m2) area, while a solar power plant built with medium category Solar Power Rocks solar panels of a similar capacity would need an area of approximately 100 ha area (178,107 MWh/(1.1 MWh/6.1698 m2) = 998,986 m2). According to the calculation of experts, a large part of greenhouse gases originate from combustion, which includes the effects of fossil fuels, waste incinerators, cement factories, internal combustion engines, etc. As shown in Table 1, the highest emissions are produced by coal and by combined coal and biomass (co-firing with coal). Although not listed in the table, the waste incineration system also produces a large quantity of extremely harmful gas emissions. 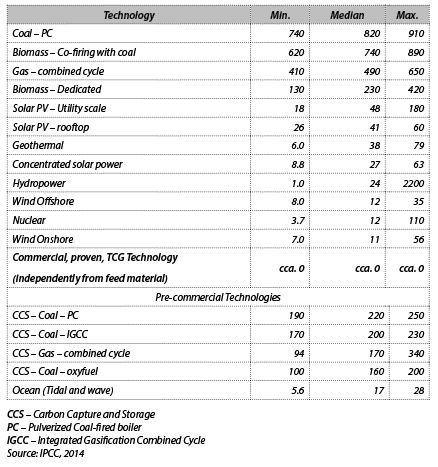 Table 1: Life cycle CO2 equivalent (including albedo effect) from selected electricity supply technologies (gCO2eq/kWh). The electricity sector has a key role to play in meeting goals for reducing GHG emissions. In the UK, the average emissions from electricity generation fell from 718 gCO2eq/kWh in 1990 to 500 gCO2eq/kWh in 2008. The Committee on Climate Change (CCC) recommends a further reduction to just 50 gCO2eq/kWh by 2030 to support achievement of the national aims. This is an ambitious plan to decrease CO2 emission if we take into consideration that the rate of emission decrease must reach 296% and the “yearly decrease” must be 242%. In a lot of countries it is vital to establish a complex plant to eliminate or at least to reduce the problems caused by the management and disposal of industrial, agricultural and Municipal Solid Waste (MSW). Landfill is unacceptable because, aside from the large area needed, it produces gases that have an influence on climate change. The major components are CO2 and methane, both of which are greenhouse gases. In terms of global warming potential, methane is over 25 times more detrimental to the atmosphere than CO2 (Monteleone, 2018; EPA website) and, for example, landfills are the third largest source of methane in California (SoCalGas website). These waste materials contain large amounts of organic parts that can be used as a sustainable resource for energy generation – but only if the technology has zero emissions. Otherwise, the high emissions of incineration will accelerate global warming, while the filtering of the flue gas of incinerators will sharply increase the operating costs. A better solution has been found: Thermo-Chemical Gasification, the TCG technology. A small group of experts and scientists led by M. Wiley developed the Thermo-Chemical Gasification (TCG) technology, which has been patented worldwide. It can utilize any organic material, like waste materials, or fossil fuels – such as coal, oil refinery residuals, and others – as feedstock. Moreover, it is able to use the flue gas of traditional, high-emission, coal-fired power plants as an additional feed material and build its recombined elements into the “Syngas” produced. Several other issues – like the disposal of infectious and general hospital wastes, the wastes of the food and meat industry or the remains of dead animals – can also be addressed worldwide by using this very effective and green technology. The recently-perfected TCG-UC plant is able to provide a solution to remedy these problems by utilizing both fossil energy source materials and organic waste material as feedstock to generate synthetic gas with high efficiency and near zero emissions, which can be utilized directly as fuel gas to generate electricity in a gas motor/turbine generator set (GenSet) or itself further processed as a feedstock to produce hydrocarbons such as ethanol, methanol, bio-diesel or synthetic natural gas (SNG) through the application of the well-known Fischer-Tropsch catalytic conversion system. TCG-UC Plant is not merely one solution among the many, but is a special solution that provides the best presently available answer to the problems associated with the environmental contamination problems created for society by the huge volumes of MSW, the millions of used tires, and organic industrial waste handling and remediation. TCG units emit no harmful or toxic contaminants; the processing units have no chimneys, therefore during the conversion of the carbonaceous materials into syngas, the system has no materials emissions into the environment. TCG technology is capable of converting any carbonaceous (organic) material (organic sludge, MSW); biomass; wood or grass; used tires; distillate, oil refinery or paper industry residues; fossil materials, or any mix of these materials) into a synthetic gas whose composition is controlled, without the uncontrolled emission of gas or liquid materials into the environment. The produced synthetic gas (SynGas) can be used directly in gas motor/generator sets to generate electricity or can serve as the feedstock for producing methanol, ethanol, diesel, jet fuel, synthetic natural gas, etc. (Figure 1). Figure 1: Process diagram of TGC-UC EL 500 plant. near-zero air emissions and liquid discharge, along with the capability of recycling un-reacted carbons back into the reactor chamber. In addition, some of the CO2 – whether generated in the gasification process or from external sources – can be captured and recycled as feedstock. Furthermore, the potential exists to readily integrate this system into a portable, flexible gas-to-liquids bio-refinery. The TCG-UC W2GE (Waste To Green Energy) System covers the whole problem area, offering a total setup: from the grinding machine, via the TCG Unit, to the SynGas-To-Electricity (GTE) Unit or the SynGas-To- Liquid (GTL)” Unit (using Fischer-Tropsch or other liquefaction technology) with specific and readily available additional equipment. Verification of the technical parameters of the operating stage was carried out by independent organizations, including the Colorado School of Mines (CSM). The responsible department of energy (through the East Bay Municipal Utility District Department) requested a study in which a consulting firm, TSS Consultants (http://www.tssconsultants.com), summarized the potential and performance parameters – analysed by independent experts – of this thermo-chemical technology from a number of different angles. Five categories were examined: economic viability; energy efficiency; environmental compatibility; research, development, demonstration and deployment (RDD&D) evaluation stages; and potential socio-political effectiveness. These categories were selected and rated using data from several hundred installations worldwide, either currently operational or in the planning stages. 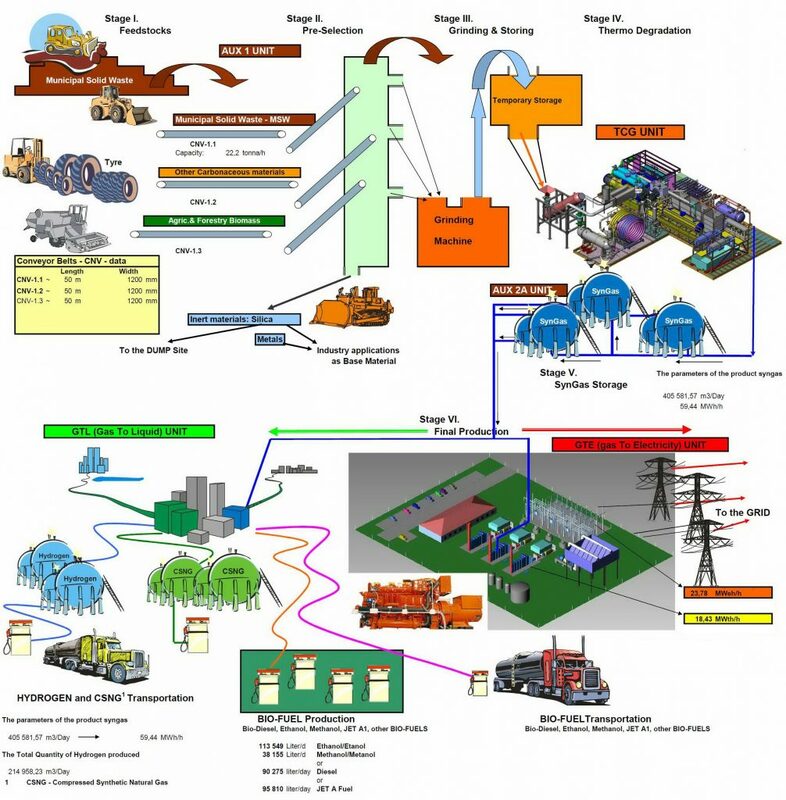 After lengthy investigation, the analysts deemed the TCG installation to be the most highly rated in the world and further recommended it to the United States Senate as one of the foremost methods available today for reducing the importance of fossil fuels in energy generation in the most environmentally-friendly and safest manner. In June, 2005, TSS Consultants concluded that “The thermo-chemical pyrolysis/steam reforming process when conducted in absence of oxygen or air is superior to all other existing technologies examined.” Considering this study, the US House of Representatives, Science and Technology Committee, Subcommittee on Energy and Environment requested testimony on research and development issues for producing liquid fuels from coal on September 5, 2007. According to the estimation of experts, GHG gas emissions could be decreased up to about 35-40% by installing TCG-UC CCT/W2GE power plants and – step-by-step – replacing the traditional coal-fired technology based power plants with this environmentally safe technology. The coal-fired TCG-UC CCT power plant and the W2GE power plant operate with these parameters if the feed material is coal, the efficiency of the process is much higher than incineration, it is not sensitive to moisture content and the quality parameters of the feed material, and there are no emissions, and the byproducts are waste heat (which can be used in agricultural and/or technical sidelines) and hot distilled water. This technology can be of great use in lowering GHGs and tackling other problems affecting our environment and economy.